Born at Woxeter, Ontario on 26 December 1884, third in a family of five children born to W. Lawrence Henry and Esther Jane Bingham. The family moved to Winnipeg when he was 8 years old and he attended the Winnipeg Collegiate Institute, graduating in 1902. 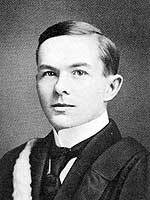 He worked for two years in the Molson’s Bank then entered Manitoba College where he graduated with a BA degree in 1908, and received a Rhodes scholarship to attend Queen’s College at Oxford, England. While in college he was active in athletics, playing on championship basketball teams. He was called to the London Bar in October 1911 then returned to Winnipeg and was called to the Manitoba Bar in December 1911. He was a member of the Manitoba Bar Association, Royal Colonial Institute, Corinthian Football Club, and Knox Church.